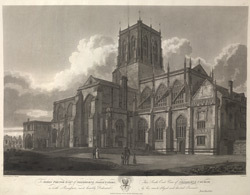 South east view of the parish church of Sherborne, which formerly was the the Abbey Church. This was originally the site of an old Saxon Cathedral to the Bishopric of Wessex, but became a monastery between 998 and 1539. In 1540 the Abbey Church was sold to the town and unlike other monastic churches, it escaped destruction. This view shows its Norman transepts and crossing tower. The rest of the building is mostly in the Gothic Perpendicular style and dates from the 15th century.